Finally (Finally!) Version 4 of monolinea is up. 2008 brought a new redesign, with a new logo, more color, and a bit more simplicity. Finally last year i decided it was time to start over from scratch. And a few (or many) months later comes version 4. Less is more. A more minimalist design puts more focus on the content. 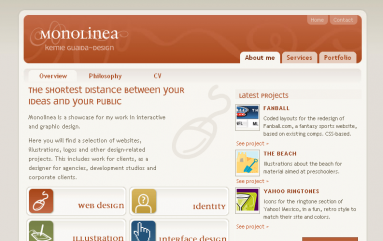 Monolinea is now responsive! Should work in phones, tablets, desktop, and anything in between. Retina ready! High res graphics and content for extra sharpness in high resolution displays. Not finding the perfect font for Monolinea, I set out and made my own. New logo (based on the previous one), based on the new font. I now have a blog. After many years of being mostly quiet, I’ll give this communicating thing a try.